Mark Fitzgerald, Amy Conroy, and Will O'Conell from Luck Just Kissed You Hello at the Galway International Arts Festival opening night. Photo Andrew Downes. 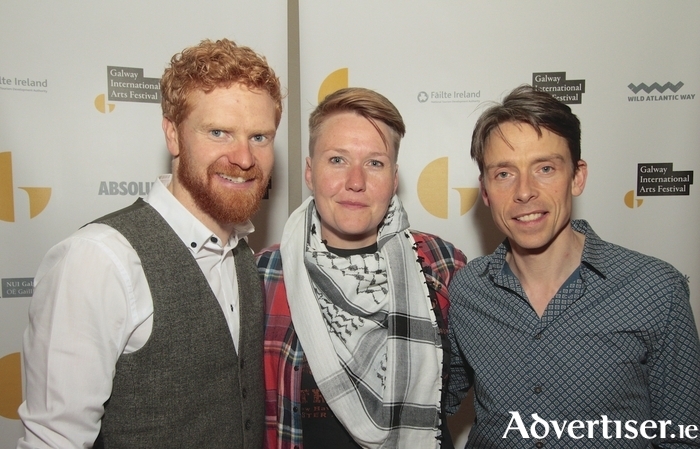 THE CITY'S arts fraternity were out in force and in high good cheer at the Radisson Hotel on Monday night for the launch of the 38th Galway International Arts Festival and the 10th under the stewardship of artistic director Paul Fahy. Arts festival CEO John Crumlish began by thanking the festival’s key funders, partners, sponsors, friends, and co-producers. He quoted Victorian designer William Morris who said art, education, and freedom are not just for the few - a motto which also informs the GIAF's ongoing commitment to making the festival as big and as good as possible. He used the analogy of the advent calendar with treats waiting behind its little doors, and observed that the festival similarly aims to provide treats behind each of its artistic doors and he invited the public to sample them. The bid organisers have already hosted 20 ‘speak outs’ which have attracted more than 1,000 attendees as well as establishing a number of teams to co-ordinate different strands of the bid. He called it a "once in a lifetime" opportunity "to change the game and transform both the city and county". He expressed the desire to inform all the citizens of the region as to what the Capital of Culture is about - culture in its widest sense embracing such areas as sport, history, heritage and food. Plans are in place to invest a budget of some €30 to 40 million into the enterprise, quite aside from capital projects. His closing comment that "2020 is Galway’s year" was greeted with great applause.